John Ashley-Cooper said that Wester Elchies has perhaps the finest pools of all. 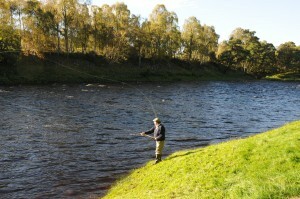 The beat is approximately 2.4 miles long and is a single bank on the left of the river Spey. Although secluded, access is easy with a road running beside the river to most pools. On the opposite bank there are the beats of Kinermony (3 rods) and Delagyle (4 rods). Wester Elchies is split into two beats each fished by 3 rods and anglers change daily after lunch. There are two huts, one for each beat; both have cooking facilities and a fridge. There is a flushing toilet on each beat. On the conservation side the number of rods fishing the beat was reduced from 7 to 6 when the syndicate took over in 1995. Anglers are expected to follow the Spey Board’s conservation policy as a minimum and anglers should expect to fish by fly. The beat has fishing during times of drought and spate. Fish are caught throughout the season from opening week to the closing day. There is a full time ghillie, 9am to 5pm, six days a week. With the 2019 season starting on the 11th of February. Already there are some weeks available. Please see the Availability page for more details.